Reliable Corporation offers a full line of silver chemicals, powder, and flake for your most demanding industrial application. Our silver nitrate has gained broad acceptance and is especially appreciated by those who demand the highest purity bone-dry nitrate product. Our silver carbonate and silver oxide are used in specialty industrial applications where purity and consistency are critical. Our silver powders and flake are used in paste, ink, and specialty lubricant preparation. We also offer a full line of silver and gold salts for electroplating and research applications. 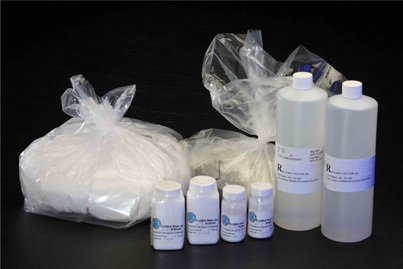 Our silver cyanide and potassium silver cyanide salts are produced from high purity silver to ensure your electroplating bath is always in top condition. Our potassium gold cyanide and sodium gold sulfite are used by the most technically advanced electroplating companies in America. We’re known for being the best in the business for delivery performance, with 100% on-time delivery being our goal. We are able to ship most silver nitrate, silver cyanide, and potassium silver cyanide same day or next day after order. Potassium gold cyanide is also commonly available with rapid order response. Let us show you what best in the business response time can do for you!